Over the last 100 years, UBC has become a leading public university recognized for excellence in research, teaching, and innovation. Considering how far the university has come in this time is exciting – can you imagine what the future holds for UBC? The UBC strategic plan: Shaping UBC’s Next Century is guiding our decisions, actions and interactions into the future, and the Focus on People 2025 framework provides a significant contribution to this plan. The next five years will present many new opportunities for all of us at UBC. New ideas, changing infrastructure, innovative technology, and fresh approaches will open up possibilities for researching, teaching, and working at the university. To enable us to harness these opportunities, the Focus on People 2025 Framework identifies four “catalyst” areas. Each takes a look at why it matters, what the numbers say, what UBC will look like in the future, and the actions to get us there. 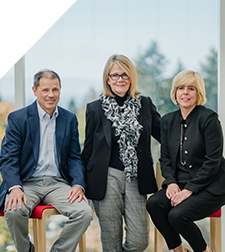 Aligned with the university’s strategic plan: Shaping UBC’s Next Century, and connected with plans and initiatives across the university, this framework is founded on your ideas. Over 1,500 faculty, staff and students responded to the consultation survey in late 2018 and shared their ideas on what will inspire them to work at UBC in 2025. Thank you to everyone who contributed. The bold steps we take together as an inspiring, diverse community focused on inclusion, collaboration, and innovation will make UBC well positioned to be one of the top universities in North America, and one of the best universities in the world. Are you ready to embrace the future together? We acknowledge that UBC’s two main campuses are located on the traditional, ancestral and unceded territories of the xʷməθkʷəy̓əm (Musqueam) and Syilx (Okanagan) peoples. Focus on People 2025 identifies four “catalyst” areas. Each catalyst takes a look at why it matters, what the numbers say, what UBC will look like in the future, and the actions to get us there.